Ceremony In Afghanistan Officially Ends America's Longest War : The Two-Way While the conflict, which has claimed the lives of some 3,500 U.S. and NATO troops, is formally ending, 13,500 foreign soldiers will remain in support roles. 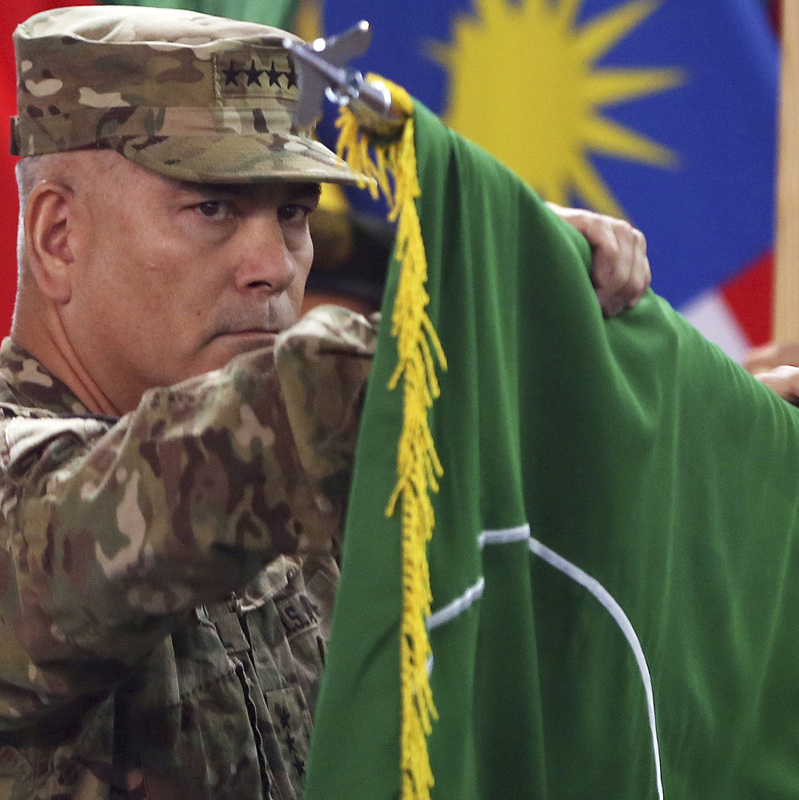 Commander of the International Security Assistance Force (ISAF), Gen. John Campbell opens the "Resolute Support" flag during a ceremony at the ISAF headquarters in Kabul on Sunday. U.S. troops and their NATO allies in Afghanistan have formally ended what became America's longest war, furling their flag 13 years after a 2001 invasion to topple the country's Taliban regime in the wake of the Sept. 11 terrorist attacks. In a symbolic ceremony meant to mark the transition in the role of the remaining troops from combat to support, the commander of the International Security Assistance Force, Gen. John Campbell, put away the green-and-white ISAF flag and unfurled the flag of "Resolute Support," as the new international mission is known. "Resolute Support will serve as the bedrock of an enduring partnership" between NATO and Afghanistan, Campbell told an audience of Afghan and international military officers and officials, diplomats and journalists. Nearly 11,000 U.S. troops will be part of the residual force of about 13,500 to assist Afghans in their own defense against an insurgency that has stepped up attacks in recent weeks even as Western combat operations wound down. "There is a need for continued support, and that's going to be given in Resolute Support," German Army Lt. Gen. Carsten Jacobson, the coalition's deputy commander, was quoted by The Wall Street Journal as saying. "But we are not here in a fire-brigade role that intervenes and takes over the fight, as we've done in previous years," he added. Afghan President Ashraf Ghani, who took office in September, reversed his predecessor, Hamid Karzai, by signing a bilateral security agreement allowing NATO to leave troops in the country after the end of the year. WSJ writes: "Afghan forces have long been shouldering most of the fighting here. This year, Afghan policemen and soldiers carried out 90% of military operations, and successfully prevented the Taliban from capturing new territory. But they also suffered heavy casualties, and still lack capabilities in areas like intelligence-gathering and air support." The grim toll in Afghanistan saw 2,224 U.S. soldiers killed, according to an AP tally. More than 1,000 other foreign troops also died. At the peak of the "surge" ordered by President Obama to combat a growing insurgency, 140,000 troops were in country in 2010. Many believe "that with the deteriorating security situation their presence is needed to back up the Afghan effort to bring peace after more than three decades of continual war. "'At least in the past 13 years we have seen improvements in our way of life — freedom of speech, democracy, the people generally better off financially,' said 42-year-old shop keeper Gul Mohammad." "On this day we give thanks to our troops and intelligence personnel who have been relentless against the terrorists responsible for 9/11--devastating the core al Qaeda leadership, delivering justice to Osama bin Laden, disrupting terrorist plots and saving countless American lives," President Obama said in a statement. "We honor the profound sacrifices that have made this progress possible. We salute every American--military and civilian, including our dedicated diplomats and development workers--who have served in Afghanistan, many on multiple tours, just as their families have sacrificed at home," he said.